I have to admit I prefer fiction to reality, and I am not above exploiting my family and friends for the sake of a good story. Be warned! ‘Summerlands’, the story published in The Trouble with Flying and other stories, began life as part of my MA dissertation and continues to evolve as part of my PhD. The novel takes place on Phillip Island off the coast of Victoria in the summer of 1975, and is based on my Lithuanian heritage and my parents’ experience as refugees after the Second World War. During the course of a single day on the island, there are family ructions, recollections and the retelling of classic Lithuanian folktales (only slightly fractured). The narrative has nine parts of which I have fully completed six. Only three to go, thank goodness. Otherwise, I continue to publish poetry, book reviews and short stories wherever and whenever possible, and distract myself by hand-stitching books of poetry (mine and those of friends), and occasionally collaborating with printmaker Marian Crawford to make limited edition artist books under the RATAS Editions imprint. Ratas means ‘wheel’ in Lithuanian and refers to coming back to what I love doing best. My continuing adventures in writing, painting and the creative life can be followed on gravelly views. Francesca Jurate Sasnaitis has recently moved from Melbourne to Perth to be with her beloved. In previous incarnations, she has been a painter, printmaker, sculptor, furniture maker, bookseller, gallery director, book reviewer, publisher and poet. 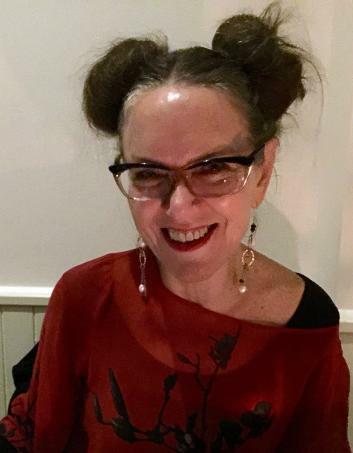 She has a degree in fine art from RMIT University and an MA in Culture and Creative Practice from the University of Western Sydney, and is currently engaged in writing her first novel as part of a PhD in Creative Writing at the University of Western Australia.